Other Amusements: Where have I been? I've been working a lot! But I've managaed to fit in some fun stuff as well, for one I visited another country house. 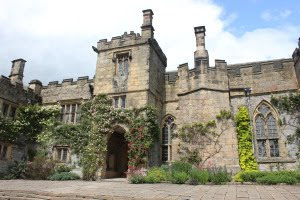 Actually Haddon Hall is "a fortified medieval manor house dating from the 12th Century". It's a fabulous place. 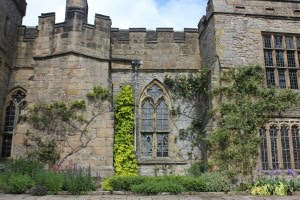 You can look round a lot of the house and gardens including the chapel; but the owners actually live there so obvioulsy you can't see their bit! I think the chapel and the kitchens were the most interesting parts. In the chapel you can see where they had religious scenes painted on the walls. They are just outlines now, but everthing would have been in full colour back then. In the kitchens you can see huge dents in the wood where they cut the food. Apparently they used to have their meat chopped up really small as they didn't have enough teeth to chew it. I took loads of photos. I seem to have taken one of every flower in the garden. There are some more on Flickr if you'd like to have a look.